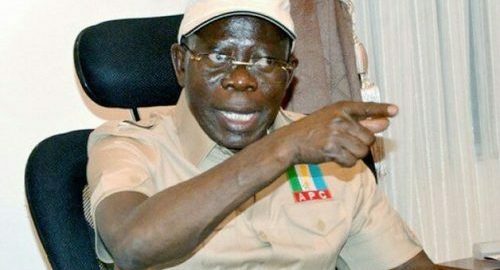 APC crisis: The Department of State Services, DSS, has reportedly been dragged into the crisis in the All Progressives Congress, APC, leading to a stand-off between chairman of the party,Adams Oshiomhole, and the security agency. The development has also worsened the crisis of confidence among APC governors. The governors, Vanguard gathered yesterday, were miffed with the action of two southern governors who lost out in the recent primaries. Some governors, it was gathered, instigated Oshiomhole’s interrogation by the DSS for hours last Sunday. A key aim of the interrogation, Vanguard learned, was for Oshiomhole to resign. The national chairman, however, stood his ground, saying he will only resign before the President. President Muhammadu Buhari, who did not get to know about the interrogation until Oshiomhole visited him after leaving his interrogators, has reportedly ordered an investigation. Meanwhile, the Peoples Democratic Party, PDP, stepped into the fray, last night, as it accused President Buhari of shielding Oshiomhole who the opposition party claimed carried baggage from his days as governor of Edo State. The DSS, Vanguard gathered, had on Sunday interrogated Oshiomhole for some hours concerning the recent primaries of the party. How Oshiomhole called DSS bluff Oshiomhole was said to have reportedly rebuffed several efforts to deepen the interrogation as he vowed that he would rather sleep in the DSS office than answer more of their questions. There were indications that issues flowing from his past may have been brought up in what one source yesterday described as a well planned civilian coup that was orchestrated to ease him out of office. A source privy to the development said the former Edo governor stood his ground and used “streetwise sense of a former activist” to rebuff the claims of inducement and other weighty allegations made against him. 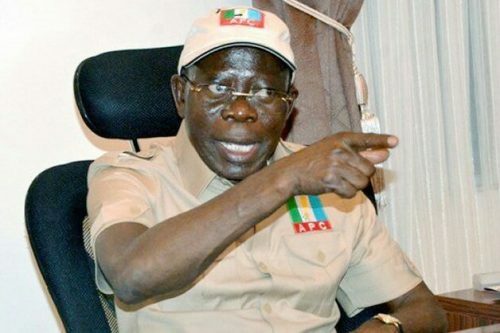 Oshiomhole, it was learned, refused entreaties to sign the resignation paper that was put to him asserting that he would not do so since he still had the confidence of the president. “He was held for hours, but he stubbornly refused to cave in,” the source said. Following the interrogation, the party chairman went to the president, who it was learned, expressed his ignorance of the interrogation of the national chairman. A source said, yesterday, that investigation over the issue had been ordered. I’m not aware — DSS spokesman DSS spokesman, Mr. Peter Afunanya, yesterday, claimed ignorance of the interrogation of Comrade Oshiomhole when contacted yesterday. Mallam Lanre Issa-Onilu claimed ignorance of the interrogation. “We do not have any information on this rumour. More so, the Chairman is not around in the country to confirm or deny this. As soon as we have any relevant information, you’ll be updated,” he said.